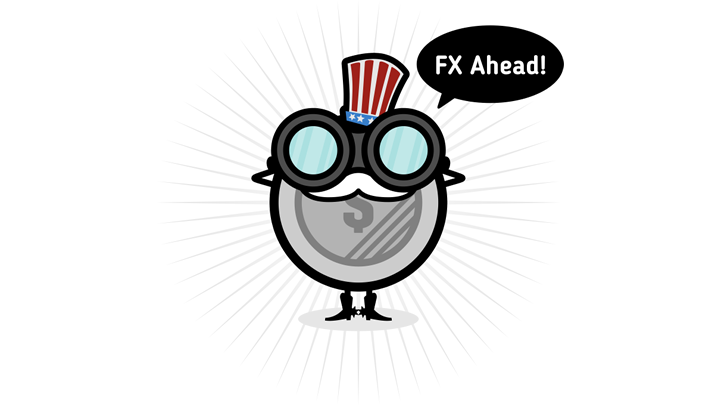 The Greenback had a pretty sweet run in the previous week, despite the ongoing U.S. government shutdown and a handful of downbeat economic figures. This time around, the lack of top-tier releases from Uncle Sam could leave traders focused on U.S.-China trade developments and changes in overall sentiment. Either that or counter currencies could take the wheel. Read more. Volatility was relatively subdued for most Loonie pairs last week, although the Canadian currency managed to snag some wins thanks to some gains in crude oil. Apart from Black Crack price action in light of global supply and demand forces, the Loonie could also take cues from overall market sentiment as usual. Read more. There was a general bearish tilt for the euro mostly due to downbeat reports from the region while the franc gave up ground as safe-haven currencies took hits. Euro zone PMI readings should provide a glimpse of whether or not the region can climb out of its rut. This comes ahead of the ECB decision during which policymakers could put the spotlight on the ongoing slowdown. Read more. Despite all the uncertainty surrounding Brexit, sterling was able to emerge in the top spot as the focus shifted to a possible extension of Article 50. PM May has yet to present her Plan B to parliament this week while likely asking EU officials for more time to renegotiate matters. Speculations could push pound pairs around for the most part of the week. Read more. Risk-on flows didn’t do the lower-yielding yen any favors in the previous week, and it didn’t help that Japanese reports weren’t so impressive either. The BOJ is slated to weigh in on the latest round of Japanese economic data, and some are speculating that the central bank might lower its inflation forecasts. How might the yen react? Read more. The Aussie turned in a mixed performance in the previous week as it took advantage of improving U.S.-China trade relations but was also vulnerable to counter currency price action. Trade developments might stay on as a major driving force for Aussie pairs in the days ahead, but the Australian jobs report and Chinese data dump are also worth keeping tabs on. Read more. The Kiwi was off to a good start on positive U.S.-China trade developments but gave up most of its gains on the release of REINZ housing data, eventually slumping to the bottom of the pile. China’s data dump might shape overall sentiment to start the week while New Zealand’s quarterly CPI could also impact RBNZ monetary policy expectations. Read more. 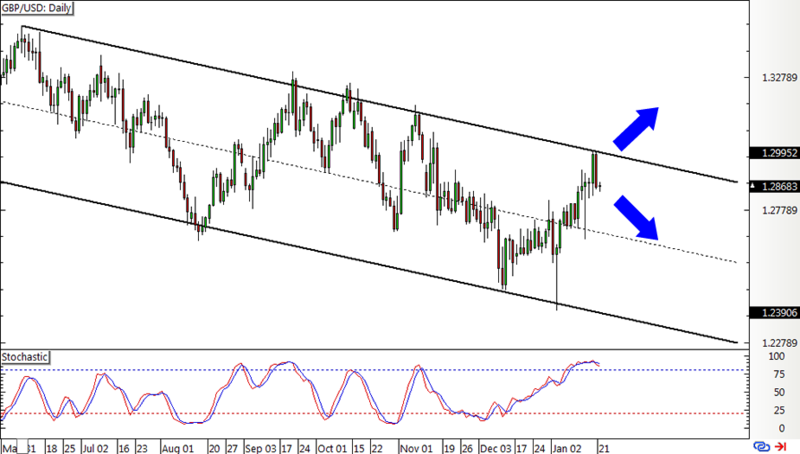 First up is this reversal pattern completed on the 4-hour time frame of NZD/CAD. 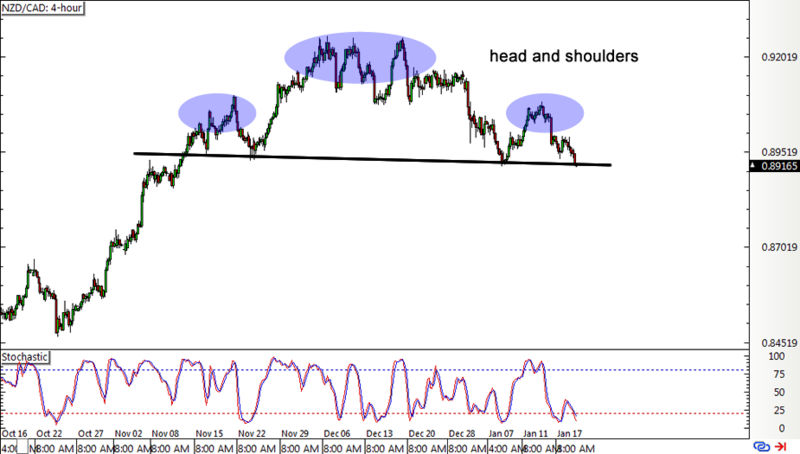 Price is now down to the neckline support, and a break below this could send the pair lower by the same height as the chart formation. Stochastic is hovering around the oversold region, though, which means that sellers could use a break.if support around the .8900 handle keeps holding, another bounce to the shoulders or head could be in the works. Still, I do hope Happy Pip hopped in that short entry she was eyeing last week! Bounce or break? It seems that Brexit optimism (or wishful thinking) propelled Cable to the very top of its daily descending channel last week. Can this week’s set of events bring the pair any higher or will bears take over? Price already seems to have bounced off the resistance and might be setting its sights back down to the very bottom or at least halfway through, especially since stochastic is indicating overbought conditions. 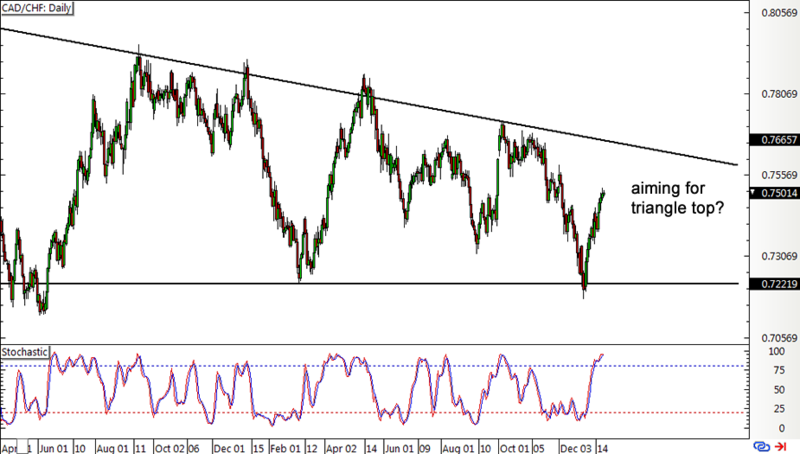 Last but certainly not least is this large descending triangle forming on the daily chart of CAD/CHF. The pair appears to be making for a beeline for the very top around the .7600 major psychological level. However, stochastic is already in the overbought zone to signal that buyers are starting to feel exhausted. Turning lower could confirm that sellers are back in the game and that another move to the triangle support close to .7200 might follow.